The treatment of lupus nephritis has changed significantly over the past decade in large part because of data from well-conducted randomized clinical trials. The concept of two phases of therapy—induction and maintenance—is widely accepted. The histopathologic classification of lupus nephritis continues to guide therapy, and treatment for all major classes of lupus nephritis has seen some shift in management during this time. New regimens using lower doses and shorter treatment durations of intravenous cyclophosphamide have been advanced to reduce toxicity without sacrificing efficacy of therapy. 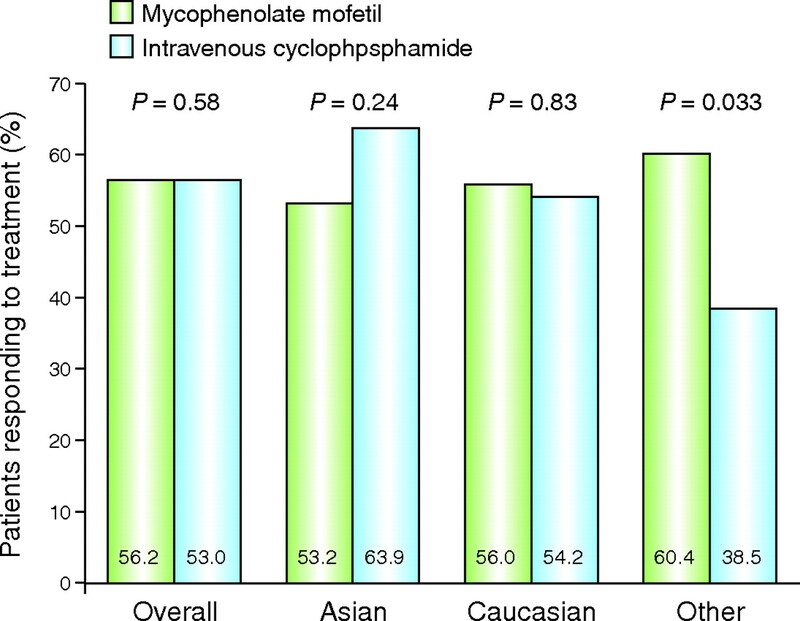 Mycophenolate mofetil has emerged as a viable alternative to cyclophosphamide for induction therapy of both proliferative and membranous lupus nephritis. Combination induction treatment with multiple agents has also been successful. Large controlled trials using mycophenolate mofetil and azathioprine for maintenance therapy have been performed. Here, we review recent additions to the growing body of literature on how to most effectively treat lupus nephritis with the least amount of toxicity. We discuss new treatment strategies currently being explored in clinical trials. Renal involvement in systemic lupus erythematosus (SLE) continues to be a major contributor to morbidity and mortality. Up to 50% of SLE patients will have clinically evident kidney disease at presentation; during follow-up, renal involvement will occur in >60% of patients, with an even greater representation among children and young adults.1,2 Lupus nephritis impact clinical outcomes in SLE both directly by target organ damage and indirectly through complications of therapy. Recent clinical studies of SLE patients with renal disease, including a number of randomized controlled treatment trials, have clarified the therapeutic role of a variety of immunosuppressive regimens both in proliferative and membranous lupus nephritis.3 The goal of each of these trials has been to achieve clinical efficacy with a remission of the nephritis while minimizing deleterious side effects of treatment. Although lupus nephritis may affect all compartments of the kidney, glomerular involvement is the best-studied component and correlates well with the presentation, course, and treatment of the disease.4 The 2004 modifications in the current International Society of Nephrology (ISN)/Renal Pathology Society classification refine and clarify some of the deficiencies of the older World Health Organization (WHO) classification of lupus nephritis.5 The current approach to treating lupus nephritis—and studying new therapeutic modalities—has largely been guided by histologic findings by ISN class with appropriate consideration of presenting clinical parameters and degree of renal impairment. ISN class I nephritis denotes normal glomeruli by light microscopy but presence of mesangial immune deposits on immunofluorescence and/or electron microscopy. ISN class II, mesangial proliferative lupus nephritis, is defined as pure mesangial hypercellularity (more than three mesangial cells in areas away from the vascular pole in 3-μm-thick histologic sections) by light microscopy with mesangial immune deposits.5 In general, patients with ISN class I and II require no therapy directed at the kidney. The majority of patients will have good long-term renal outcomes, and the potential toxicity of any immunosuppressive regimen will negatively alter the risk–benefit ratio of treatment. An exception is the group of lupus patients with minimal change syndrome or lupus podocytopathy,6–8 who respond to a short course of high-dose corticosteroids in a fashion similar to patients with minimal change disease. Optimal control of BP through renin angiotensin aldosterone system (RAAS) blockade is a cornerstone of conservative therapy in lupus nephritis. The National Kidney Foundation's Kidney Disease Outcomes Quality Initiative guidelines recommend interruption of the RAAS with angiotensin-converting enzyme (ACE) inhibitors or angiotensin receptor blockers as first-line anti-hypertensive therapy in the management of proteinuric kidney diseases, including lupus nephritis.9 These drugs decrease intraglomerular pressure, lower systemic arterial BP, reduce urinary protein excretion, and delay the progression of chronic kidney disease to ESRD.10–12 A recent report from the lupus in minorities: nature versus nurture cohort suggests that ACE inhibitors delay the development of renal involvement in SLE.13 Eighty of 378 patients (21%) in the cohort used ACE inhibitors. The probability of renal involvement free-survival at 10 years was 88.1% for ACE inhibitor users and 75.4% for nonusers (P = 0.01), and by multivariable Cox proportional hazards regression analyses, ACE inhibitors associate with a longer time-to-renal involvement occurrence (hazard ratio, 0.27; 95% confidence interval, 0.09 to 0.78). ACE inhibitor use also associates with a decreased risk of disease activity (hazard ratio, 0.56; 95% confidence interval, 0.34 to 0.94). The RAAS, and its pharmacologic blockade, may play a role in the pathogenesis and prognosis of SLE independent of its effects on systemic BP and glomerular hemodynamics. A number of animal studies have highlighted the inflammatory components of the RAAS and the potential benefits of RAAS blockade in reducing or eliminating this inflammation in lupus nephritis.14 De Albuquerque et al.15 treated lupus-prone mice with captopril and found that captopril delays the onset of proteinuria when administered to prenephritic mice and slows progression of disease in mice with early and advanced lupus nephritis. These results were not seen in a control group treated with verapamil. The ACE inhibitor–induced improvement in renal disease correlates with reduced TGF-β expression, particularly of the TGF-β1 and TGF-β2 isoforms, in the kidneys. Moreover, in vivo or in vitro exposure to captopril reduces splenic levels of IL-4 and IL-10, suggesting an effect of captopril on the immune system of treated animals. In a recent experiment on the effect of aldosterone blockade on the development and progression of glomerulonephritis in a murine model of lupus, spironolactone significantly reduces the incidence of nephrotic range proteinuria and, on histology, showed far less severe glomerular injury (no crescents, diminished overall cellularity, and less prominent deposits in the capillary loops and mesangium) compared with controls.16 The investigators found significant differences in levels of anti-ssDNA and anti-dsDNA antibodies between control mice and mice treated with spironolactone by 36 weeks of age, again highlighting a potential anti-inflammatory, immune-mediating component of RAAS blockade. ISN class III, focal lupus nephritis, is defined as focal segmental and/or global endocapillary and/or extracapillary glomerulonephritis affecting <50% of the sampled glomeruli. ISN class IV, diffuse lupus nephritis, has diffuse segmental and/or global endocapillary and/or extracapillary glomerulonephritis affecting ≥50% of glomeruli. Both class III and class IV may have active (proliferative), inactive (sclerosing), or combined active and inactive lesions subclassified as A, C, or A/C, respectively.5 Most patients with active proliferative lupus nephritis are initially treated with corticosteroids (traditionally a pulse of intravenous steroids followed by a high-dose oral regimen that begins to taper at 8 weeks) used in conjunction with other immunosuppressive agents. Clinical trials in the last decade provide support for using mycophenolate mofetil (MMF) as an alternative to intravenous cyclophosphamide for induction therapy in severe lupus nephritis (ISN classes IIIA, IIIA/C, IVA, and IVA/C). Cyclophosphamide remains a reliable and effective treatment for inducing remission in lupus nephritis. Whether oral therapy or intravenous pulses of cyclophosphamide is more effective in treating lupus nephritis remains inconclusive, but intravenous therapy involves a lower cumulative exposure to cyclophosphamide, less frequent cytopenias, enables enhanced bladder protection, and avoids problems of nonadherence.17 Randomized, controlled trials at the National Institutes of Health in patients with severe, proliferative lupus nephritis established that six pulses of intravenous cyclophosphamide (0.5 to 1 g/m2) on consecutive months, followed by every third month follow-up pulses with low-dose corticosteroids, was effective and prevented relapses better than a shorter regimen limited to six doses alone.18 A subsequent controlled trial established that pulse cyclophosphamide when given with monthly pulses of methylprednisolone led to better long-term GFR than either regimen alone.19 Nevertheless, side effects were significant in both therapeutic arms of this study and included ischemic and valvular heart disease, avascular necrosis, osteoporosis, and premature menopause. Major infections occurred in 33% of subjects treated with cyclophosphamide alone and 45% of subjects treated with cyclophosphamide plus steroids. Therefore, more recent studies using newer regimens focuses on achieving the high induction response rate of “National Institutes of Health protocol” cyclophosphamide with fewer side effects. Rates of complete and partial remission in the Aspreva Lupus Management Study (ALMS) trial. After 6 months of therapy, induction therapy with either MMF or monthly intravenous cyclophosphamide pulses showed virtually identical rates of remission. In subgroup analyses by race, nonwhite and non-Asian subjects showed significantly higher rates of remission with MMF than cyclophosphamide. Reprinted from ref. 26. Other agents have been explored in induction regimens, typically used in conjunction with MMF and/or steroids. Rituximab, an anti-CD20 monoclonal antibody that depletes B cells, is useful in inducing remissions in some patients with severe lupus nephritis, including those who have failed cyclophosphamide or MMF therapy.29,30 However, recent data from two randomized controlled trials in which rituximab or placebo were added to standard immunosuppressive regimens failed to show a benefit for rituximab in this setting. The Exploratory Phase II/III SLE Evaluation of Rituximab trial tested the efficacy and safety of rituximab versus placebo in 257 patients with moderately-to-severely active extrarenal SLE but without lupus nephritis. Background treatment was evenly distributed among azathioprine, MMF, and methotrexate. No differences were observed between placebo and rituximab in the primary and secondary efficacy endpoints.31 The Lupus Nephritis Assessment with Rituximab trial randomized 140 patients with severe lupus nephritis to rituximab or placebo added to a full dose of MMF (up to 3 g/day) and tapering doses of corticosteroids. Although more subjects in the rituximab group achieved complete remission or partial remission, there was no statistically significant difference in the primary clinical endpoint at 1 year. Although these results do not support the routine use of rituximab, the nature of their trial designs—adding rituximab to full, effective doses of conventional therapy in small numbers of patients studied for relatively short follow-up periods—may have contributed to the likelihood of negative results. Thus, the role of rituximab remains unclear in the treatment of lupus nephritis, but it may still be of use in treating resistant patients, preventing flares, or reducing the number or doses of other immunosuppressives. Another induction treatment strategy studied in small settings is to combine a calcineurin inhibitor with MMF or azathioprine plus corticosteroids. This multitargeted immunosuppressant regimen is akin to those used in protecting kidney transplants. For example, Bao et al.32 randomized 40 patients with diffuse proliferative lupus nephritis superimposed on membranous lupus nephritis (ISN class IV + V) to induction therapy with MMF, tacrolimus, and steroids (multitarget therapy) or intravenous cyclophosphamide plus steroids. Intention-to-treat analysis showed a higher rate of complete remission with multitarget therapy at both 6 and 9 months (50 and 65%, respectively) than with cyclophosphamide (5 and 15%, respectively; Figure 2). Adverse events were lower in the multitarget group also. Probability of achieving complete remission for lupus nephritis patients treated with mycophenolate mofetil + tacrolimus + steroids (multitarget therapy) versus IV cyclophosphamide (CTX). Reprinted from ref. 32. Plasma exchange has been added to other cyclophosphamide induction therapy in several trials without any shown benefit in terms of renal or patient survival.33 Therefore, the routine use of plasma exchange is not justified in lupus nephritis, although this procedure may be of value in unique individuals such as those with a refractory anti-phospholipid antibody and contraindications to anti-coagulation or those with both positive lupus and ANCA serologies. For patients with life-threatening resistant disease, small pilot studies have used total lymphoid irradiation, and immunoablation by high-dose cyclophosphamide and anti-thymocyte globulin, with or without reconstitution with autologous stem cells.34,35 Although these approaches have led to some sustained, treatment-free remissions, they are potentially toxic and have significant treatment-related mortality. They have not been widely studied or embraced as therapy for lupus nephritis. Once remission has been induced, maintenance phase therapy should focus on the long-term management of chronic, more or less indolent, disease. The goals of continued immunosuppressive therapy are to avoid relapse and flares of disease activity, to avoid smoldering activity leading to chronic irreversible renal scarring, and to prevent long-term side effects of therapy. A number of meta-analyses unequivocally favor the additional benefit of using an immunosuppressive agent (or agents) during the maintenance phase of lupus nephritis therapy.33,36,27 Given the risk for long-term toxicities with such agents, as well as their potential effect on fertility and risk for teratogenicity, the selection and dosage of maintenance therapy is an important and modifiable choice that doctor and patient should make together. Corticosteroids remain a major component of treatment in the maintenance phase of lupus nephritis therapy, and there are no clinical studies that exclude the use of steroids in maintenance therapy. However, to minimize the side effects of long-term steroids, the dosage should be limited, and osteoporosis prophylaxis should be given concomitantly; many clinicians will have their lupus nephritis patients off steroids within the first 1 to 6 months of maintenance therapy despite a lack of trial data for such a strategy. Although both intravenous and oral cyclophosphamide have been used for maintenance therapy in a number of trials, their use for >3 to 6 months of maintenance should be avoided because of toxicities, which include alopecia, hemorrhagic cystitis, bladder cancer, gonadal damage, and early menopause. Both azathioprine and MMF show efficacy in maintaining remission and preventing relapses in patients with lupus nephritis.37–39 These agents are superior to continued intravenous cyclophosphamide in both preventing lupus nephritis flares and maintaining kidney function. Of equal importance, these agents show significantly lower rates of long-term toxicity, including an approximately 80% lower risk for amenorrhea and 65 to 70% lower risk for infection.37 The equivalence of MMF and azathioprine for maintenance was most recently shown in results from the MAINTAIN Nephritis Trial (A Randomized Multicenter Trial Comparing Mycophenolate Mofetil and Azathioprine as Remission-Maintaining Treatment for Proliferative Lupus Glomerulonephritis) which are currently available in abstract form. In this randomized, open-label trial, after induction therapy with intravenous cyclophosphamide (Euro-Lupus protocol), 105 subjects with class III (31%), IV (58%), or V (10%) lupus nephritis were given either azathioprine (mean maximum daily dose, 124 mg) or MMF (mean maximum daily dose, 2.0 g) maintenance therapy and followed for at least 3 years. The rates of all primary and secondary endpoints—including remission, steroid withdrawal, and disease flares—were equal among both groups. In contrast, results of the Aspreva Lupus Management Study (ALMS) maintenance phase, also currently in abstract form, were notable for superior renal benefits (in time to treatment failure and renal flare) with MMF versus azathioprine. Azathioprine, in doses of 1 to 2.5 mg/kg per day, has proven remarkably safe over much longer periods of follow-up.40 Macrocytosis, leukopenia at high doses, and interaction with allopurinol (limiting its use in patients with gout) are all potential side effects, along with the ever-present risk of infection from immunosuppression. Nevertheless, azathioprine has only a small oncogenic potential, and pregnancy during maintenance azathioprine is relatively safe compared with a number of other immunosuppressive agents. Although MMF has a similarly favorable, long-term toxicity profile, it should not be used during pregnancy.41,42 Given that many patients with lupus nephritis are women of childbearing age, this difference in therapies can help individualize therapy in some patients. Class V, or membranous, lupus nephritis is defined by subepithelial immune deposits. The membranous alterations may be present alone or on a background of mesangial hypercellularity and mesangial immune deposits. Investigators report very different renal survival rates for different populations with membranous lupus nephritis. These differences were, in part, caused by problems with the WHO classification, which included proliferative lesions superimposed on pure lupus membranous nephropathy (WHO classes Vc and Vd) along with those with only predominantly pure membranous features (Va and Vb).43 In addition, patients with subnephrotic proteinuria and pure membranous lupus nephritis do extremely well regardless of treatment options, and no consensus of management has emerged yet for this group of patients, who may not require any specific therapy beyond RAAS blockade. Most treatment regimens studied for pure membranous lupus nephritis with nephrotic range proteinuria are based on successful therapies used for idiopathic membranous nephropathy. For example, Austin et al.44 randomized 42 patients with membranous lupus nephritis to three groups: cyclosporine for 11 months (on top of steroids), alternate-month intravenous pulse cyclophosphamide for six doses (also on top of steroids), and alternate-day prednisone alone. At 1 year, the cumulative probability of remission was 27% with prednisone, 60% with cyclophosphamide, and 83% with cyclosporine. Remissions occurred more quickly in the cyclosporine group, but there were fewer relapses in the cyclophosphamide group.45 Similar data are available from small numbers of patients treated with tacrolimus monotherapy.46–49 Two recent trials of MMF versus intravenous cyclophosphamide induction in lupus nephritis24,26 included 84 patients with pure membranous lupus nephritis among the 510 patients enrolled. In a pooled analysis of these participants, remissions, relapses, and overall clinical course were similar in the membranous patients treated with oral MMF and intravenous cyclophosphamide induction therapy (Figure 3).50 The previously discussed study by Bao et al.,32 in which MMF was combined with a calcineurin inhibitor, lays out yet another potentially useful treatment regimen for cases of class V lupus nephritis associated with class IV proliferative lesions. In pooled analyses, MMF was equivalent to cyclophosphamide (IVC) in inducing remission for patients with class V lupus nephritis. Data from ref. 50. Thus, for patients with membranous lupus nephritis with nephrotic range proteinuria, there are multiple treatment options including a course of oral cyclosporine or tacrolimus, monthly intravenous pulses of cyclophosphamide, oral MMF, or oral azathioprine plus corticosteroids. Given the higher likelihood of relapse with calcineurin inhibitors and the potential, over the long term, for nephrotoxicity with these agents, MMF may emerge as the preferred induction and maintenance therapy for class V lupus nephritis. However, this will need to be proven in larger controlled randomized trials. A number of new, immunomodulatory agents are currently being studied to improve outcomes in lupus nephritis, principally class III and IV proliferative lupus nephritis. As is the case with rituximab, these agents are being studied as additive therapy on top of induction regimens that are now considered standard of care, either MMF or intravenous cyclophosphamide.3 Ocrelizumab, a fully humanized anti-CD20 monoclonal antibody, was evaluated as adjunctive induction therapy in the Study to Evaluate Ocrelizumab in Patients With Nephritis Due to Systemic Lupus Erythematosus. Rituximab, a chimeric half murine-half human anti-CD20 monoclonal antibody, has been associated with the development, in approximately 10% of treated patients, of human anti-chimeric antibodies that are of uncertain significance.51,52 These antibodies have the potential to block the efficacy of future doses of rituximab. The design of Study to Evaluate Ocrelizumab in Patients With Nephritis Due to Systemic Lupus Erythematosus was based, in part, on the hope that ocrelizumab would have better outcome and safety profiles than rituximab because of the absence of human anti-chimeric antibody formation; however, the trial was stopped prematurely because of more serious and opportunistic infections than expected in recipients of ocrelizumab than placebo. In case reports from Europe, adrenocorticotropic hormone (ACTH) shows promising results in patients with nephrotic syndrome of various etiologies, including membranous nephropathy, membranoproliferative glomerulonephritis, minimal change disease, and focal segmental glomerulosclerosis.58,59 In a randomized trial in idiopathic membranous nephropathy conducted by Ponticelli et al.,60 ACTH and cyclophosphamide achieved equal rates of disease remission. Acthar gel, an ACTH formulation available in the United States with Food and Drug Adminstration approval for treating resistant nephrotic syndrome and SLE, may emerge as another potential treatment option for lupus nephritis, particularly class V lupus nephritis. Clinical trials are currently being planned to explore this route of therapy. The last decade has seen a tremendous amount of new data from well-conducted studies on how to best treat lupus nephritis by achieving favorable outcomes with the least amount of therapy-associated toxicities. However, the disease burden of lupus nephritis remains large, particularly among young women, and hence new therapies, or new regimens based on old therapies, are still actively being sought. The treatment of lupus nephritis today is markedly different, and objectively more effective, than it was 10 years ago. The hope and expectation is that a similar claim will be made 10 years hence. Drs. Bomback and Appel have received research support from Genentech, Roche, Aspreva-Vifor, Novartis, Teva, Alexion, and Questcor. Dr. Bomback has served as a consultant for Novartis and Questcor. Dr. Appel has served as a consultant for Genentech, Roche, Bristol-Myers Squibb, Teva, and Questcor. This manuscript was supported, in part, by The Glomerular Center at Columbia University Medical Center and Zo's Fund for Life.